What is the main diet? Let me simplify this as much as possible. Rats need 14-16% protein. Any less and they will be malnourished and any more and they will get protein itch. Especially males. Other nutrients are also necessary. And the only way to get it is to have a product that has a guaranteed analysis. Too many people and breeders are not paying attention to this and they are throwing anything together on a whim. And the quality or lack thereof of rats is very noticeable. I prefer to use a grain diet. One made by a man with a degree in animal nutrition. My mix has a guaranteed analysis I do not know of any other mixes made by breeders that can say that. Most people are throwing random grains together and not knowing why they are doing it. I did not make this diet myself, I am not qualified to do so. I've used this mix since 1998 and my rats are known for their longevity and beauty. You can either use this diet which rats do very well on and have healthy long lives, or you can use a diet that gives you rats an average or below average life span. Such as the ones that tell you to feed your rats sugars and molasses or Subees diet. And sugars have been proven by science to cause seizures in rats. So these diets are not as good for your rats, nor are they proven to help rat's life span. Myself and the Colorado rat community of nearly 500 people on the Colorado rat list did try Harlan + fresh vegetables and fruit for a quite a few years, but we all saw a decrease in lifespan of 50% across the board. Many breeders around the world have had this same experience. While some others swear by it. 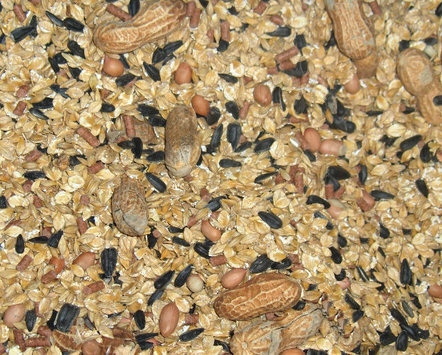 15+ years ago people thought peanuts were bad for rats, but that is very, very old info. And out of date. There is also no science in it. So we have all since switched back to this grain diet, and life spans are back up again. Thankfully. People from all over the world email me telling me they use this mix and love it. Its a very popular diet. 1/2 part oat groats (Steel cut oats). Or as an alternative to the Calf Mana: A bird pellet non fruit flavor for medium birds. IE.. Zupreem, Harrison's, Kay Tee Exact, Roudybush. Or the bird pellet from Excello. Or you can use calf manna from the fed store. The recipe was actually made with it not a bird pellet. But it has an ingredient my hubby is allergic to. So I have to use an alternative. Or you can use meat bird builder from a feed store for chickens and or water foul. So many options! 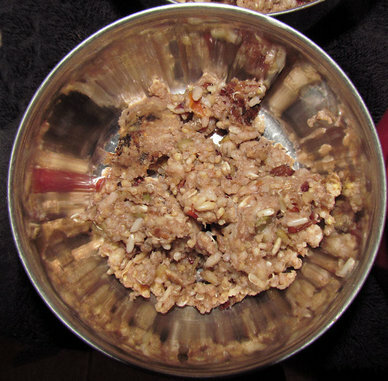 1/4 part senior dog food of high quality. Only natural ingredients please! IE... Innova, Taste of the Wild, Chicken Soup For Dogs, Wellness, Pinnacle etc. Do not use garbage dog foods as these will give your rat tumors. IE... Old Roy, Science Diet, Iams, Alpo or anything from a grocery store or super store. Those are all really bad! Optional (I do this): For babies up to 3 months old and pregnant and nursing moms only add a "raw diet". If you wish. Optional: A pinch of raw pumpkin seeds daily. Around 4 seeds per rat. This is a good treat food. 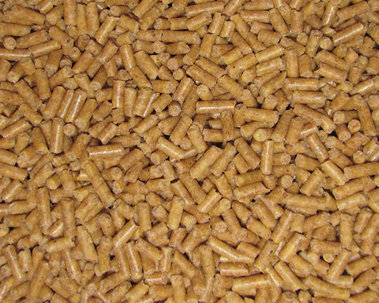 Pictured Here:Roudybush Maintenance Pellets but you can use others. Remember not to use a fruit flavor pellets as its usually full of d-limonene which male rats cannot have. Also if you are looking for an alternative to peanuts because if a peanut allergy, I cannot help you. I am not certified in small animal nutrition. And I would not know how to get the guaranteed analysis correct if the peanuts were removed. I am not qualified to do that. That would need someone with a degree in nutrition to figure that out. Go to Curve Feed in Lakewood Colorado to get your grain. Tell the owner Chris I sent you. Chris makes my mix for rat owners in Colorado. So get your future feed mix from her after you adopt from me. I do not supply grain mix for the life of your rat. I have worked with Circle F feed in the the Springs on making and selling my diet. They now stock it. If you are out that way you can always buy it from them. Cook Mixes - My Babies Are Raised On It - NOT A MAIN DIET! JUST A TREAT. All the flavors are great. I like the cinna spice delight, apple berry, veggie. Go to the vitamin cottage because they have bulk organic ingredients. Here is a list of what you need. Its a no fuss recipe. If you want to change or just eye ball the parts please do so. Its not an exact science. A big box of all of this usually costs me $23. 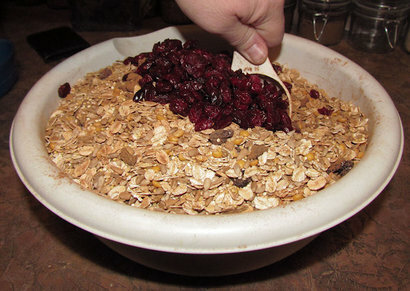 10) 1/2 part Organic Raisins (Iron) add a 1/2 part of dried cranberries if you want to! Stove top: In medium saucepan, bring 2-1/4 cups (530ml) of water and 1 cup (235ml) Cook Mix to a boil. Cover with tight fitting lid, reduce heat to low and simmer for 15 minutes. Remove from heat and let sit, covered, for 5 minutes. Cool completely before serving. 2) Add your favorite veggies, fresh or thawed frozen mixtures. 3) Mix it in with the already cooked mix. You can store in the fridge for 4-5 days. Use your common since on that one. Its a no fuss mix once again, no need to ask what a part is. Use any measuring container you want make that your part. And if the store doesn't have whats listed, its no fuss, skip it and pick up something else that looks tasty to you. Add things not listed here. This is a rough example of what you can do. If you want to don't use any of these and do a bean mixture. Vitamin cottage has a isle full of beans. Mix them with the Brown Rice and wing it. If you want Gluten Free, do that. It's not a fuss! Just feed it to them along with the lab blocks or grain, which ever your feeding. There is no need to worry about measuring which would not be possible with more than one rat anyway.